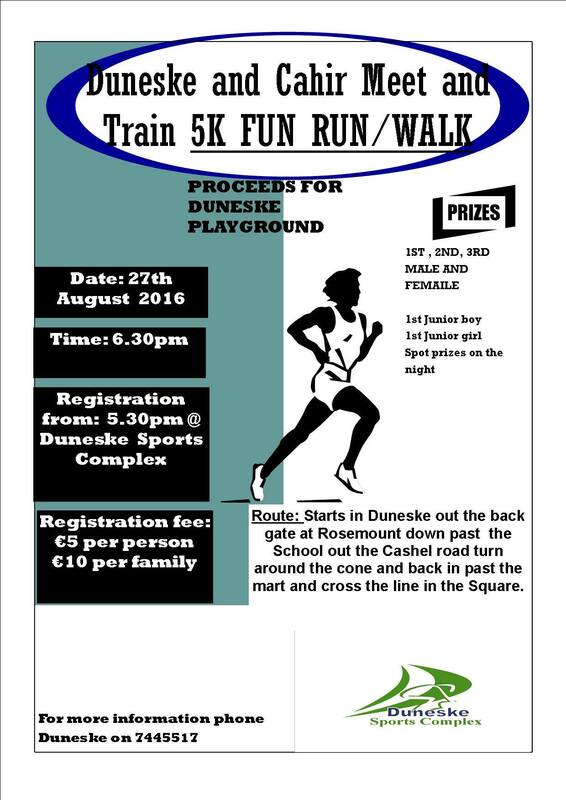 The Duneske and Cahir Meet n' Train 5k fun run is taking place on Saturday 27th August @ 6.30pm starting at Duneske and finishing in the Square. It is the same weekend as the Fair of Cahir so lots of action around the town that weekend. There will be prizes for 1st 2nd and 3rd male and female and 1st male and female junior. It is not chip timed and registration is €5 in Duneske from 5.30pm onwards and a family is €10. Duneske is a community facility and the playground relies on fundraising in order to keep it maintained all funds raised will go towards playground so please come and support the race! !